It's always hard for me to get back into the groove of art making when I've been out of it for a while. So when I finally got back to my studio last week I needed to do something simple yet fun and I like nothing more than creating backgrounds for my journals. 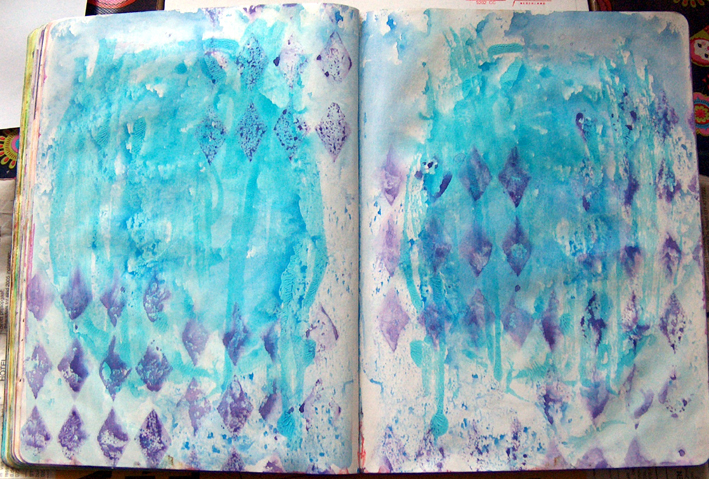 Making backgrounds or prepping journal pages is just really playing with art materials without any real purpose. 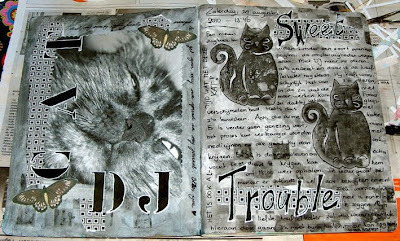 I mostly worked in my everyday journal. The pages are all prepped with gesso already, because of the flimsy paper, but a lot of them still needed color. What is new about this journal is that instead of acrylics I am doing most of the backgrounds in gouache and watercolor. 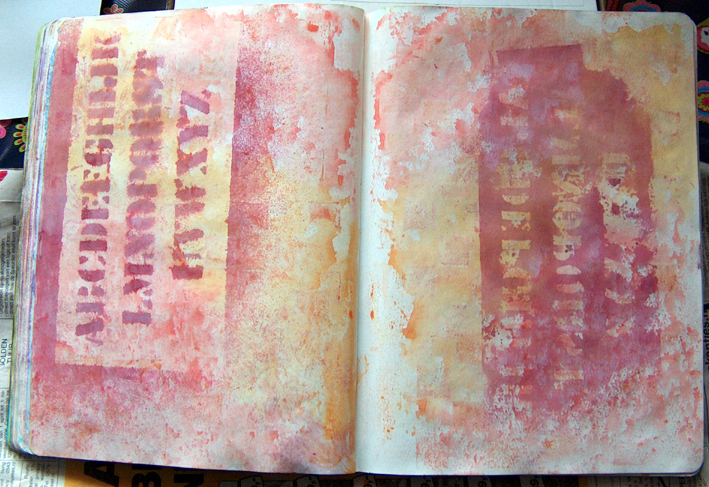 I never really thought about things like stamping or stenciling in watercolor paints, but it works wonderfully. You get a less 'neat' look, but I kind of like that. It gives a 'dreamy' atmosphere. 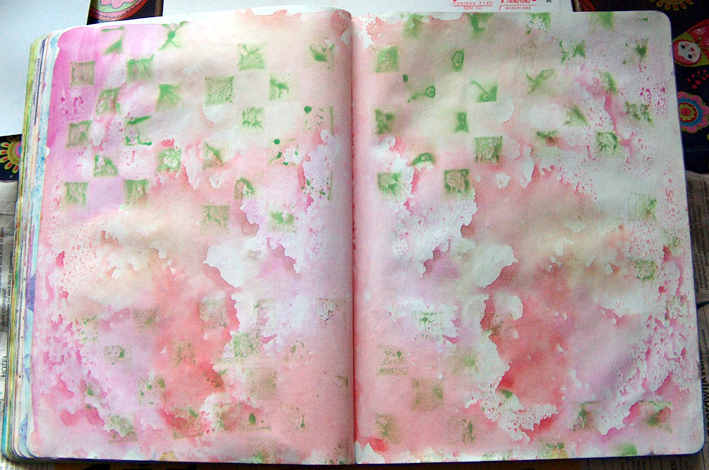 I also like that you can 'mess' with the paint because the gesso is not absorbing it so much, so it stays on the page before it dries and you can manipulate it. 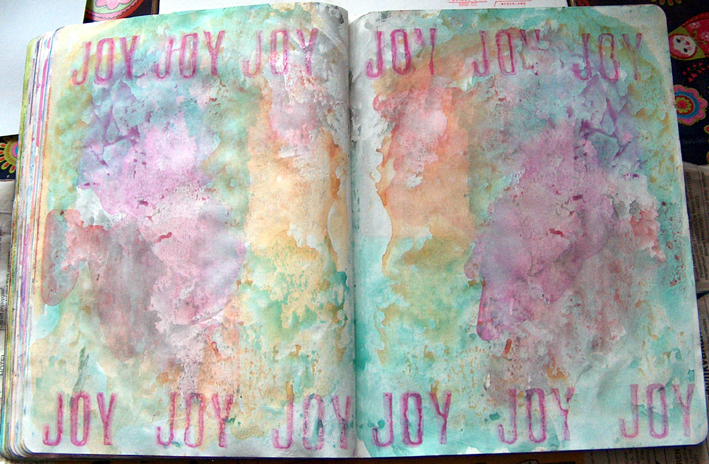 You can just put different colors of wet paint on one page for instance, close the journal and so print on the opposite page. The effect is wonderful. I am having the most fun with my foam stamps. They seem to be going out of style these days with all the clear stamps and ordinary stamps, but I love using them, they are ideal to use with paint. Especially the ones that just have simple shapes on them like diamonds, circles and squares. The above pictures are just a sample of a truck load of spreads I did last week, but it seems a little too much to show you all of them. You get the idea. 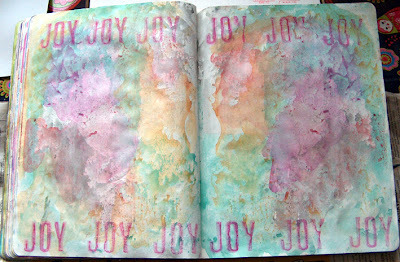 By doing these spreads and starting of with something easy I have finally gotten back into the mood for art making and art journaling and I have been in my studio just about every day. It's good to be back in the rythm of making things. 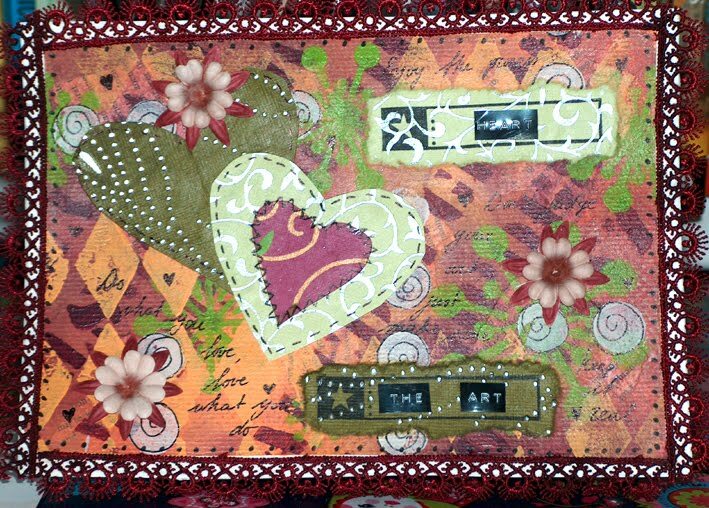 A few years ago I was really into atc-making and trading. I made tons and tons of those little cards and pretty much traded all of them (I think I have two left now in the box where I store them). But the past year I have hardly done any trading on a regular basis. I do keep a somewhat irregular ongoing mail art swap with a friend of mine and every now and then I will spontaneously trade with someone whose work I like. 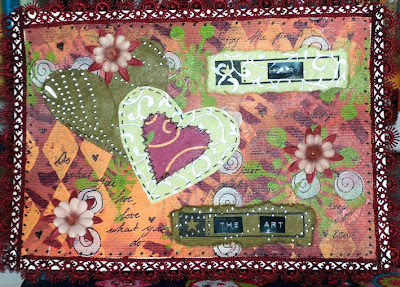 I don't really miss the atc's at all, but when the talented Samantha Kira Harding suggested a small art penpal swap on her site (see the links section) I just could not resist. Mostly because there was more free reign than with an atc swap and because I only had to make one thing. Like I've said before, I don't fair well with themes and assignments, so it seemed fun to just make something relatively small for a complete stranger. As you can see it is done in my 'new' style. 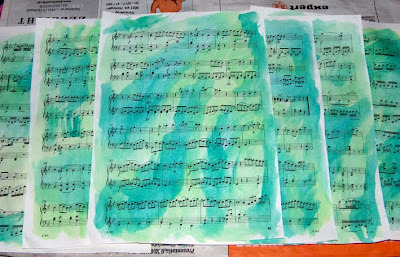 The piece measures 21x15 cm and is done on thick watercolor paper. I found it difficult to put this style on a smaller substrate than the bigger acrylic papers I've done the other ones on. It seemed like the size was constraining me, but I hope it doesn't show too much in the final piece. 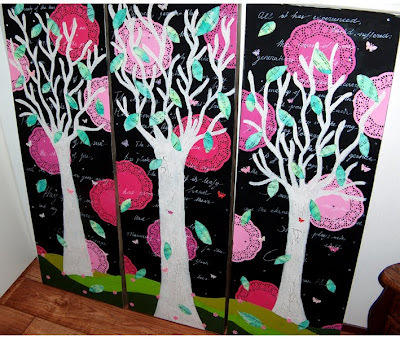 As we speak, the piece is traveling to the USA and I hope it arrives safely. Can't wait to see what's coming my way. These are truly the cooler things about the internet, these connections we make through art with strangers who share our passion. Wonderful! Other things that kept me busy were social events with friends and family, a local arts and music festival, and the fact that a big delivery came from IKEA, and you know what happens when things come from IKEA, right? You have to put the furniture together! This usually is accompanied by curses and blisters, but I stilll managed to do it all myself. One thing I just have to show you is my brand new book case for my studio. 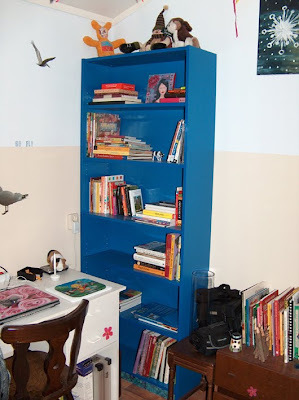 The books were piling up on the floor so I really needed one and I decided on a bright blue one that's about two metres high. And I am so happy with it that I'm going to show it to you, haha. Yes, it's tucked away in the corner a little, I had no other place to put it, but I can reach all the shelves just fine. And do you know what I like best about it? All those empty spaces it still has! This means I can buy tons of books before it fills up again. By the way, in my studio only art related books are 'allowed' and I am growing a wonderful collection. Of course as with all my enterprises one detail went completely wrong. 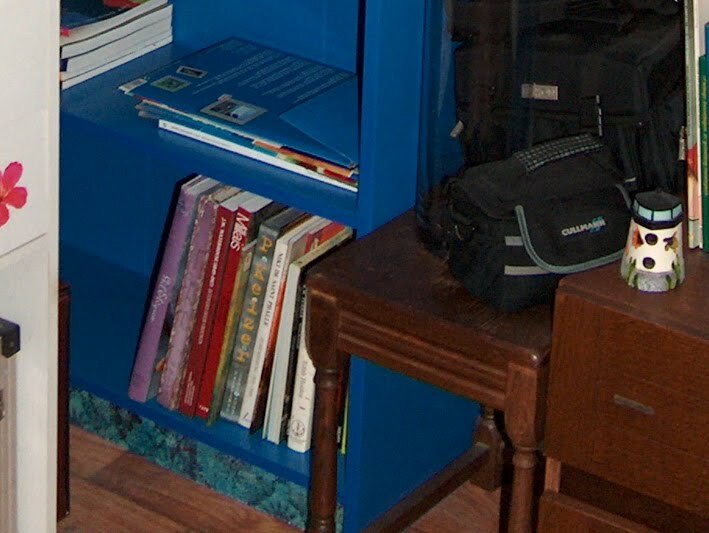 The bottom piece of wood I somehow managed to apply backwards to the rest of the book case. This meant that at the bottom there was now this really ugly piece of brown wood. I did not see this until I was finished and in order to change it I would have to redo the entire case and I just did not have the energy. So being the creative gal I am I found a quick and easy solution to this and simply applied some pretty matching scrapbooking paper with gel medium. You can see it a little better in this one, just look at the bottom of the picture. So within a minute I had a unique book case! ;-) I'm quite proud of my quickie solution! Anyway, with all the busy times and set backs (like my cat dying) there was hardly any art making in the past weeks, except for finishing my trilogy on september 8. But I started again last monday and am trying to get back in my artsy routine, so I will probably show you some new things soon. Other important news is that I delivered my trilogy to my niece and she loved it! Yay! I am now waiting for her to hang them on her wall and send me a picture of it which I will of course post here, cause I'm so proud and happy that she really liked it. I want to thank all of you for giving so many wonderful comments on the trilogy, that really made my day(s). Today was spent finally finishing the Tree Trilogy. I will show the rest of the process to you, 'cause I haven't been keeping you up to date at all (sorry). 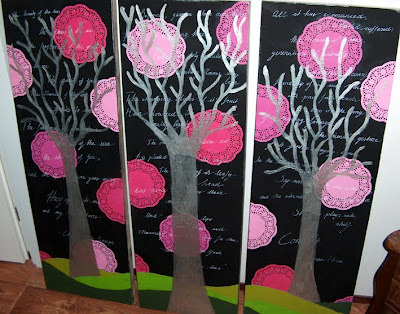 First I put silver paint over the sketches of the trees that I showed in an earlier post. It took two layers of silver to make it stand out a little. Silver paint is so translucent! After the silver I crackle medium on the trees. I took no picture of this, because the medium is translucent and it would not show on the picture anyway. After the medium had dried I put on another layer of acrylic paint. Titan buff this time, which is a lovely off white color. 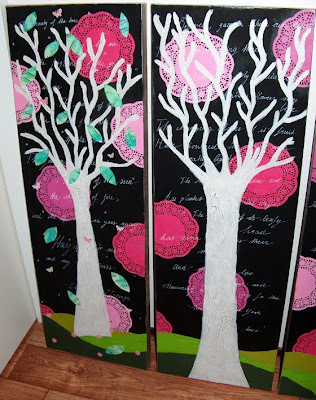 After all this tree painting (imagine painting the same trees four or five times, sigh) it was time to make some extra collage material for the leaves I wanted to put on the trees. I took a couple of sheets of music paper and painted it several colors of green with gouache. I really like the effect on the paper and I may do this for other projects as well. Pretty paper was never so easy to make, haha! I drew leaf shapes with a drawing pen and cut them out. I didn't even need all the sheets of paper so I still have some left that I may use in one of my journals. 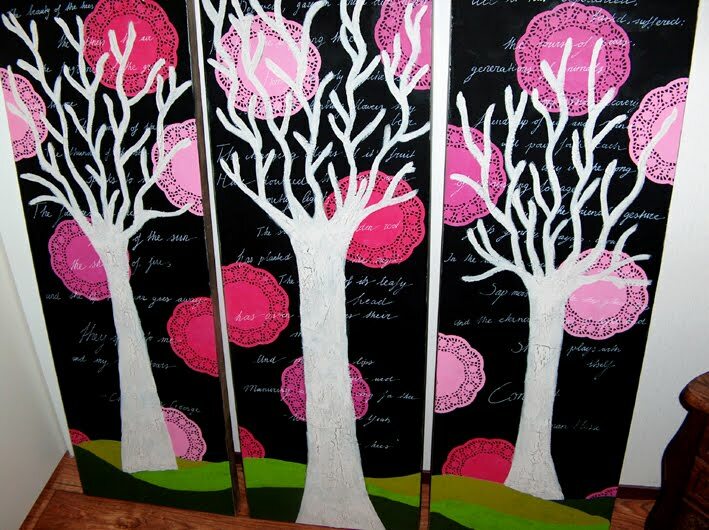 I put the leaves on the trees with gel medium. Just to show you a little before and after effect I put a finished painting next to an unfinished one. As you can see I added some other stuff as well. I added these fabric shiny little flowers and butterflies I had lying around and also some silver .... jeez, what do you call them....those little glimmering metallic things? Anyway, they really reflect the light very nicely. All of that stuff was put down with gel medium as well (where would we be without gel medium?). You can't really see, but the sides of the paintings are painted in silver as well. And also (and if I sound stuck up saying this you can tell me), the picture doesn't do it justice. It's way more vibrant and glittery in real life and I believe my niece said she wanted some bling, so that should be good. I am quite proud of the result and I am also quite relieved it is finally finished! Back to small work for me, I'm way better suited for that, haha. Lastly I want to give my thanks to all of you who have sent me your sympathy, either on this blog or elsewhere about the death of my cat. It is much appreciated, thank you so much. I was quite surprised that even my vet sent me a sympathy card today! I thought that was so nice of her. People can really surprise you sometimes. The past week has been a sad one for me. 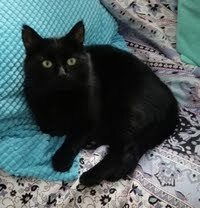 If you've ever read my profile you could see that it said I live with two black cats. Unfortunatele that is no longer true. Last friday one of them died. His name was DJ (not a name I gave him by the way). He was not really himself physically for a while and lost a lot of weight in a short period of time. I went to the vet and she told me he suffered from kidney failure. He needed to get medication and he also got a dose of fluids which meant he had to stay at the vets for a few hours. 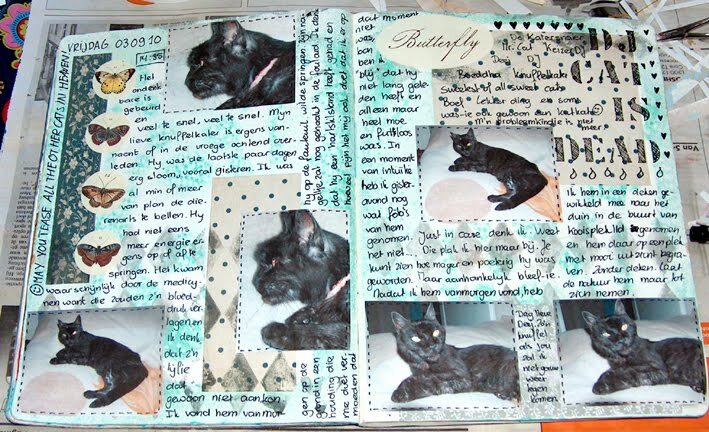 During those hours I couldn't think of anything else to do than to dedicate a spread in my everyday journal to him. 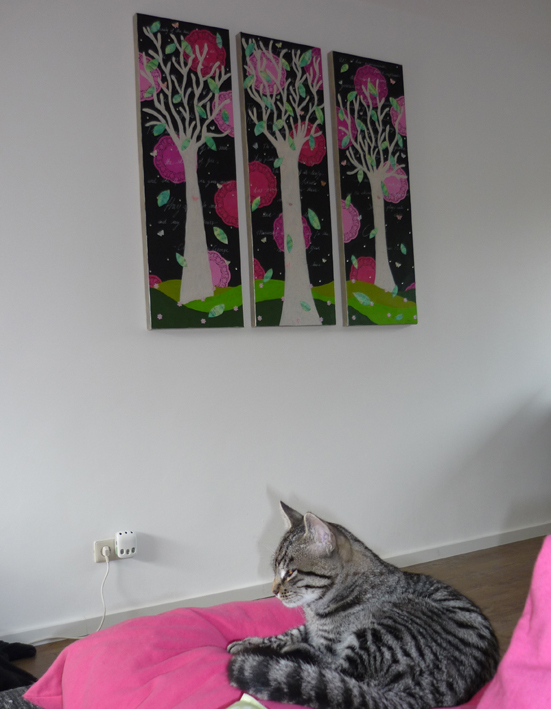 On the left you can see a picture of him in his somewhat younger days. It also shows his character which was all about enjoyment and being cuddled and petted as often as possible. I got him and his sister Mara when they were 7 years old from an animal shelter. They both have been with me for 8 years now and are/were the sweetest of cats you could imagine. The words 'Sweet Trouble' refer to the fact that he was indeed sweet but there was always something going on with him. If a cat got hurt it was DJ, if a cat got sick it was DJ, if a cat found it necessary to mark his territory by peeing it was DJ. After the visit to the vet things got worse rather fast and last thursday he was so tired and slow that I really started to worry about him. I decided to call the vet on friday, but it was too late. I found him on my living room floor on friday morning. I think his heart just stopped. It was a sad discovery of course, but I am kind of grateful he did not really suffer any pain. I buried him in the dunes and hope nature will claim him soon. As if on some instinctual impulse I actually made pictures of him the night before. I am not one who often photographs her pets, but somehow it seemed important to do so now. And it turned out that it was. 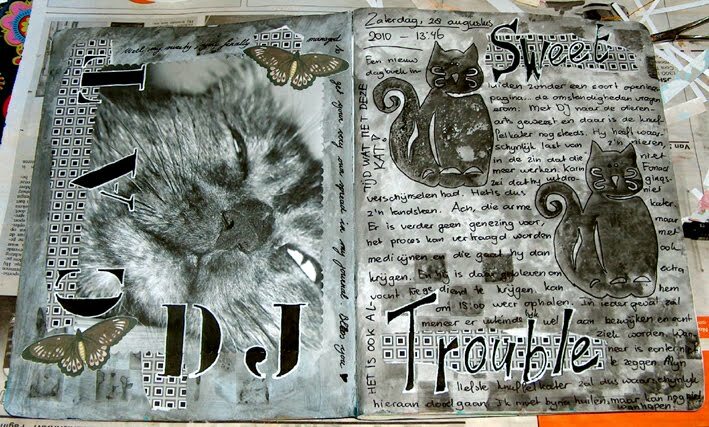 So with the last pictures of my cat I made another spread in my everyday journal announcing his death. So, this is not a happy post I'm afraid, but that's life. 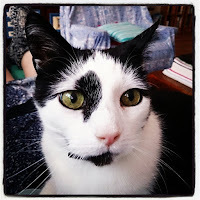 I will miss my cat and can only hope his sister will outlive him by many many years.